The first few rows of a knitted blanket designed and created to celebrate the centennial of the National Parks. I have been meaning to write this post for weeks now, but decided that this week – National Parks Week – was most appropriate. April 16th – 24th is National Parks Week for 2016 – this means that entrance fees into the parks are waived and national parks units across the country are holding special events. It also means that Twitter created an adorable little park ranger emoji as part of the #findyourpark campaign. Not only do I bring knitting with me to conferences, but also to national parks where I do my field work. After the conference, on my plane ride back home, I planned a knitting project to celebrate the national parks and the centennial of the National Park Service. The project would be a quilt-style blanket made up of a knitted square for each national park and one square to represent the National Park Service. Some quick math made me realize that having a square for each park and one for the NPS was going to be 60 knitted squares. And if I wanted there to be any resolution and flexibility in the design of the squares they would need to be relatively large (6″ by 6″). There was no way I could accomplish this project on my own (while also trying to succeed in academia and having something resembling a life). So I quickly contacted the lovely members of my knitting group out of Logan, Utah – Smart Knits – and ran the project idea by some of the more seasoned knitters in the group. The response was more enthusiastic than I could have ever dreamed! Nine other knitters volunteered their time, creativity, needles, and sometimes frustration to the project. Some members of the knitting group even moved away during the project and continued to work from a distance; mailing me their finished blanket squares. We split up all 59 national parks, secured a generous yarn donation from Knit Picks, and began designing. Nine months later, I had a stack of blanket squares piled in my office, ready to be blocked, photographed, and released on Ravelry (a clearing house for knitting patterns). And I could not have been more pleased with the finished squares! The ingenuity, creativity, and crafting skills of my knitting group blew me away! We decided to name our project the National Park Centennial Celebration Blanket. Each National Park is represented in the blanket by a 6″x 6″ square. Some of the blanket squares are colorwork designs while others are abstract representations of the park or a resource protected by the park. Each blanket square pattern comes with an introduction to the national park it represents and explains the inspiration for the square. The National Park Service is also represented through one of the square designs (only available to those who buy a blanket subscription) – making a total of 60 squares. These 60 squares can be arranged into a blanket that is 6 squares by 10 squares or 5 squares by 12 squares. Stack of all of the completed National Park Centennial Celebration Blanket. There are two options for purchasing the blanket square patterns. For $20, knitters can purchase a subscription to the National Park Centennial Celebration Blanket eBook. Subscribers will receive 5 blanket square patterns per month from January 2016 through December 2016. The blanket squares will be released in the order in which the national parks were designated by the U.S. government. With the subscription, knitters can slowly work on the blanket during the entire year of the NPS Centennial and end the year with a completed blanket. Subscribers will also receive a special blanket square that represents the National Park Service on August 25th, 2016 (the 100th anniversary of the Organic Act of the National Park Service being signed into law). For those individuals not wanting to buy a subscription to the blanket, each individual blanket square pattern will also be released on Raverly for $1. These squares can be purchased and used to knit drink coasters, pieced together to make a scarf of your favorite national parks, or knit together in a smaller baby blanket or place mat. We realized that this project could take up a ton of yarn and given that our knitting group is made up of mostly poor graduate students, we knew we could not afford to all buy yarn for this project. So we prioritized the colors that we wanted to include in the blanket (mostly earth tones), decided to knit the blanket in DK weight yarn, and contacted Knit Picks about a yarn donation. Knit Picks kindly donated more than enough yarn to complete the project. Thanks Knit Picks! To knit the blanket you will need two skeins of each of these colors of Knit Picks Swish DK: Coal, White, Marble Heather, Twilight, Dusk, Forest Heather, Allspice, Garnet Heather, Honey, and Bark. We tried to use only these 10 colorways in our designs but you will see other accent colors occasionally used. You have a few options here, you may substitute for similar colorways that have already been purchased from Knit Picks. Alternatively, you may use scrap yarn from your stash that is a DK weight as accent colors for some of the squares. You could also buy a few additional skeins of accent colors from Knit Picks (you will likely just need one skein of each). Some accent colorways that we used of Knit Picks Swish DK include Conch, Doe, Marine Heather, and Wonderland Heather. Depending on the size of your yarn stash, this blanket could also be done completely as a stash busting project! Each square takes, on average, about 25 to 30 yards of DK weight yarn. The blanket can also be knit in heavier or lighter weight yarn depending on what you have in your stash. Yellowstone National Park was our nation’s first national park (Thanks Teddy Roosevelt!). Yellowstone is represented here in a knitted blanket square with a depiction of Grand Prismatic Spring. Since we realize that the back of the blanket will be a bit of a mess with floats from Intarsia colorwork, weird stretching from cables, and weaved in ends – we will be designing a national parks-themed fabric backing for the blanket to be posted on Spoonflower this summer. So individuals who knit the blanket will have an option to buy the fabric from Spoonflower. We are going to provide instructions to the blanket subscribers for adding a fabric backing. Lucky for Smart Knits, one of our members is a sewing instructor at Utah State University! Subscribers will also receive instructions for knitting a border that can then be sewn around the edge of the finished National Park Service Centennial Blanket. This border will also provide an easier way to attach a fabric backing to the completed blanket. The border can be knit with leftover yarn from the project, stash yarn, or through purchasing extra skeins of the Knit Picks Swish DK colorway that you would like to use for your border. Our example will be knit with Knit Picks Swish DK in Bark. The border is completely optional. Some individuals are crocheting borders around each square to make a buffer when seaming the squares together into the blanket. An alternative to the fabric blanket is knitting a backing for each individual square or double knitting the squares. Share the project with a friend! One member of Smart Knits is sharing the pattern with her mother-in-law and they are each knitting half of the blanket squares to be combined into a single, finished blanket. What other ideas do you have to make this project your own? Sir Lambsalot – our Smart Knits mascot – hanging out and knitting in his own knitted “national park” complete with mountains, streams, and lovely vegetation. This blanket project is not just a way to celebrate the national parks and the National Park Service, but it is also a way to support the national parks. All proceeds from the sales of the National Park Centennial Celebration Blanket (both subscriptions and the sales of individual squares) is being donated to The National Park Foundation. So many thank yous to my amazing knitting group, Smart Knits, for their passion for the project and their love of national parks! Natalie, Adrian, Leah, Kelly, Ryan, Liz, Reina, Beth, and Jennifer – you guys rock so hard. Thanks to Cindy from Ravelry for her enthusiasm for the project and for volunteering her time (even though she has never met any of us!) to editing the patterns before I send them out to subscribers! You are amazing and a testament to why I love the knitting community. Thank you to Knit Picks for their yarn donation to start this project! Without their help and kind donation this project would not have been possible. The past year, blogging has taken a back seat to organizing this project. I blog as a form of education and outreach for public lands and outdoor recreation. During 2015 and likely most of 2016, the time I would have spent writing posts will likely be spent writing up, editing, and releasing patterns for the National Park Centennial Celebration Blanket. So, expect to see fewer blog posts this year, but hopefully I can continue to find time to explore our nation’s national parks during the centennial year! And you to should go find your park! Google created a handy little map to help you out. I cannot wait to see all of these amazing projects on Ravelry! Also, if you post on Instagram feel free to use the hashtag #npsblanket and #findyourpark (the official hashtag for the NPS Centennial). Happy knitting! Last week, the first paper from my dissertation work was published in the Journal of Environmental Management. If you want some light reading, the paper is open access for the next month or so at this link. I took a break from blogging this Fall while I have been working on another type of outdoor recreation/public lands outreach project with my knitting group. My next blog post will be about this project! I am so excited with how it has turned out. But this week, I wrote a guest post over at The Eco Tome that is an introduction to recreation ecology and the types of basic questions that we ask in our field. As a side note, this collaboration was inspired by a meeting Megan Litwhiler at ComSciCon Applications for this year’s ComSciCon are being accepted until March 1st. Friday I turned my dissertation into the library at Utah State. 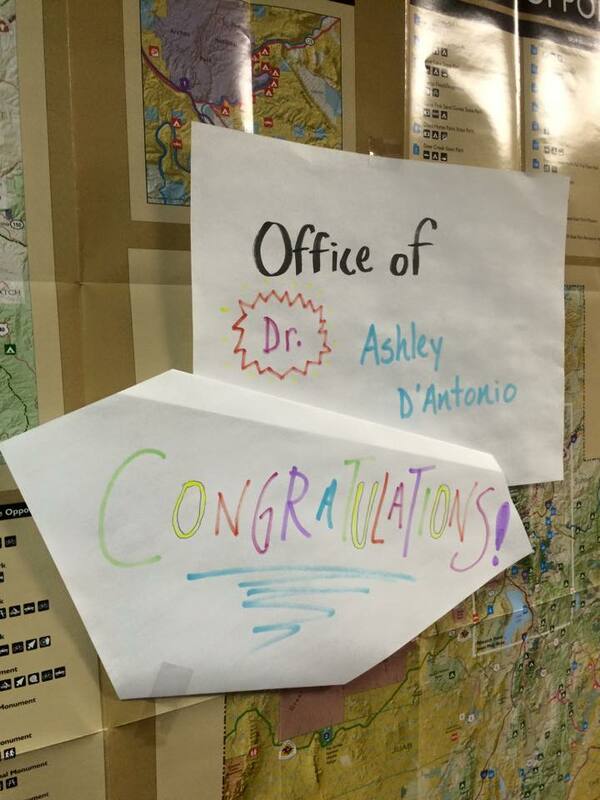 This means that I am officially “Dr. D’Antonio”. As far as I know, I am one of few members of my family to go to college, the first in my family to go to graduate school, and definitely the only one to get a Ph.D. – my parents are super proud. For me, I just feel relieved to have my defense over (I caught a cold and had some technical difficulties so that could have gone better) and my dissertation done. Otherwise I don’t think the whole idea of being “finished” has hit me. Next week, I officially start a postdoc position at Utah State where my main responsibility will be teaching. I am really excited about this opportunity and it is also allowing my partner and me to delay the inevitable “two-body problem” by at least a year. Before the semester starts though, my first responsibility as a postdoc is a small research project in a place I love. And that is really what this post is about – finding my park. My last post was about social media and how it has been used to catch vandals in US National Parks. But that is not the only way in which social media and national parks are converging these days. More and more, social media is being used by land management agencies (like the National Park Service, the USDA Forest Service, and the BLM) to engage with the public. Here I am going to highlight two social media campaigns that attempt to engage new audiences and bring those audiences out to experience public lands: The “Red Chair Experience” campaign from Parks Canada and the “Find Your Park” Campaign by the National Park Service. 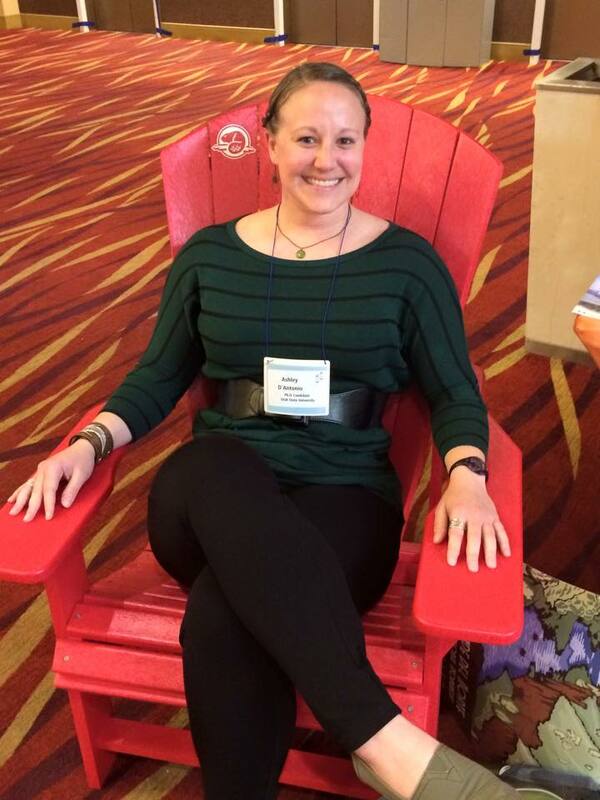 Me “participating” in the #sharethechair campaign at the George Wright Society conference. This past year I have upped my social media presence and tried to become a bit more “social media savy”. Besides making an effort to become more active on Twitter, I also created an Instagram account. Honestly, the inspiration for starting to use Instagram was that I feared my constant posting of cat photos on Facebook was going to cause me to lose some friends. But on Instagram, the more cat photos the better, right? Unfortunately (or maybe fortunately) this post will not contain any cat photos, but it will contain links to Instagram photos of illegal activity occurring in national parks . On Friday night, while taking a break from work – because grad students trying to defend soon work on Friday nights – I noticed an interesting post on Twitter from Modern Hiker that linked to Instagram. Is @baronandre tagging inside @joshuatreenps? #Repost @baronandre with @repostapp. That image was found on the Instagram account of Andre Saravia (AKA Mr. Andre) a french graffiti artist and appeared to show a graffiti tag in a location that looks suspiciously like it was taken in Joshua Tree National Park. Mr. Andre stated that the photo was taken in a friends backyard (private property). However Modern Hiker, with the help of other social media users, did a great job “sleuthing” and found that the tagging indeed occured within the boundaries of Joshua Tree National Park. Joshua Tree’s Chief Ranger received various calls about the graffiti and the park is beginning to investigate. Happy 100th Anniversary Rocky Mountain National Park! When people outside of my field find out that I do research in national parks, inevitably the question of “Do you have a favorite national park?” comes up. I always have a really hard time choosing; each national park is unique and I honestly I like them all. But when pressed, I usually respond with “It’s a tie between Isle Royale National Park and Rocky Mountain National Park.” I have already done a blog post about why I love Isle Royale National Park. Given that tomorrow is the 100th anniversary of the signing of the legislation that created Rocky Mountain National Park, I figured that I would celebrate it’s centennial by writing a post about why I love Rocky Mountain National Park. My first visit to Rocky Mountain National Park during a research scoping visit. I am the one on the left looking around in wonder and awe (photo by Annie Weiler). I am a postdoc in natural resources. I am fond of baked goods and knitting as well as any activity that takes place outdoors. You can also find me on Facebook, Ravelry, Instagram and Twitter.